There’s something about being in nature with familiar plants and glimpses of animals that is comforting and restorative for me. I am relieved whenever I hear a Swainson’s thrush sing or see a salmon return to a local stream. There is still some wildness in this place. 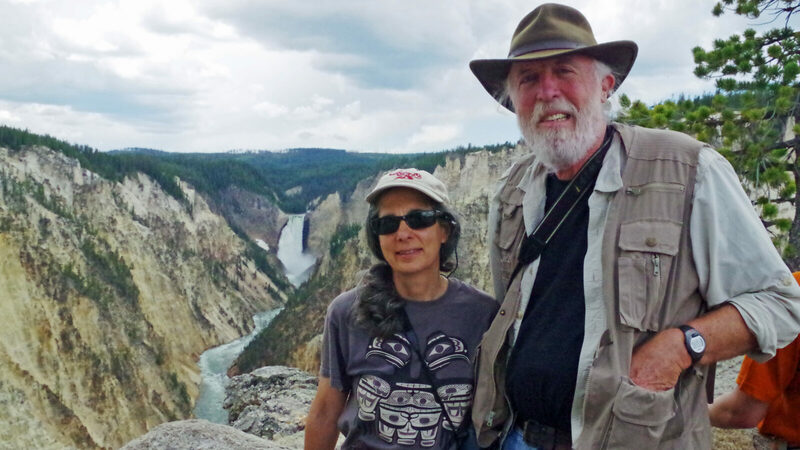 My husband, Bill Yake and I have been lucky enough to swim, paddle, hike and sit still in many natural places around the world; to discover their special plants, birds and sea life. Some of these places are nature preserves that still exist because there were people who valued nature more than potential profit. We are grateful for the forethought, generosity and altruism of those involved in saving them. But in other places, such as southeast China, terraced farms reach far up mountainsides, and where there were forests, people carried off the duff for livestock bedding. Sometimes I look at our forested mountains and imagine what they would look like with millions of people inhabiting them. We are lucky that much of our landscape is currently protected. But as the world population increases and other places become less habitable, pressure on our shores, forests, prairies, and estuaries will intensify. Coming generations of humans, forests, salmon, and even those diverse species especially well adapted to Puget Sound dampness — the fungi, lichens, and native slugs — will become increasingly dependent on these refuges. We are long-time volunteers with Capitol Land Trust, especially in the Green Cove Creek watershed. We enjoy visiting the property we monitor as well as other conserved lands. And I feel like we’re making a difference when restoration sites transform over time from Scotch broom and Himalayan blackberries to native trees and shrubs. We have a lot of respect for Capitol Land Trust, its staff and board, and are delighted that the organization has been so successful in conserving properties in southwest Washington. This year we updated our estate plans, which include Capitol Land Trust. We believe that we are temporary custodians of ‘our’ property and should share the planet with other species, and we wanted our estate plan to reflect that. People inheriting a tax-deferred account such as an IRA, need to pay income taxes, but nonprofit 501(c)(3) organizations do not. As we made our plans, we thought about who and what we love, and what would benefit them the most in the future. Hopefully future generations will also be delighted by birds singing, salmon splashing and trilliums blooming in the woods. And by a low sun backlighting the shaggy moss that hangs from gnarled Big-Leaf Maple branches.